In 1974 I design a unique system having omnidirectional characteristics. One of the features of this multiple driver system is the high power handling at higher frequencies. The first design is in the shape of a pentagon. It consists of the drivers from the ML-1C system. There are four 12" woofers on two adjacent faces. There are two 8" mids. One is mounted facing upwards with a small enclosure behind it. The second one faces downward into the first one and it has a small enclosure behind it. Above this is a circle of 016 1-1/2" upper midrange domes. Above that is a cluster of 2-1/4" tweeters. They are formed in a circle plus four are angled upwards at an angle of 45 degrees. A switch in the center of the tweeter cluster changes the radiation pattern. Although this started out as a commercial disco system, it can also be used in the home as well. The 360-degree radiation pattern, however, makes placement against a wall or in a corner undesirable due to the resulting reflections, uneven response and smeared imaging. When placed out in the room well away from reflecting surfaces, the system works very well. To be more compatible with home requirements, I add a switch for the domes and tweeters. This connects all of them for the omni position, front and back drivers for the figure eight position and front only drivers for the front position. The omni and front positions connect all the drivers in phase. In the figure eight position, the rear facing speakers are connected out of phase for operation similar to an open back dipole speaker. Horacio Moreno, an associate engineer that I hired, assembles the systems and develops the crossover networks for them. A four, two and single woofer system is planned using the pentagon shape. 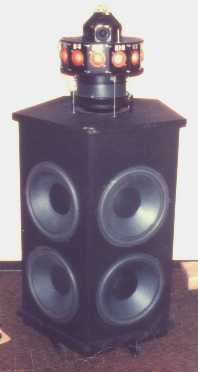 The woofers are on two adjacent faces except for the single woofer system that is on a flat recessed panel across two faces. An open top framework and grille is made to house the top section for use in the home. Warren & Friedman are again hired to design the appearance of the systems. Although the systems work very well, the complex construction of the cabinets make the cost relatively high. A second square version is constructed using more recent drivers from the XR5 system. It consists of a square four woofer bass cabinet and a top section having a circles of nine 5" lower-mids, twelve 1-1/2" 035 upper-mids and sixteen 2-1/4" tweeters. The top section can be installed separately upside down at the ceiling for use in a disco. The bass section can be located on the floor. The switch at the top now affects the lower mids as well as the upper mids and tweeters and is more effective in controlling the directional pattern. Power level and fuse lights are located in the bass cabinet. New information indicates that the demand for disco use is insufficient. The costs, with the large number of drivers and relatively high priced cabinets, for home use is too high at this time to make a production product. The projects are cancelled. Looking back at the first system, it reminds me of the robot in a 1954 grade B science fiction movie called GOG. It's very similar except it has no arms. Oddly enough there is a second robot in the movie called MAGOG. Of course two are needed for stereo! Not only that but the movie was originally made in 3-D!